John Bayliss was a crash-tackling centre who played 403 games for the club between 1960 and 1976, captaining Gloucester in 1972-73. He played over 50 times for Gloucestershire. Breaking his neck in 1973, John thought his career was over, but came back the following season to play in Gloucestershire’s 1974 championship winning side, going on to captain the county to victory in the 1975 and 1976 finals. He played for Western Counties against Fiji and New Zealand and was an England trialist on a number of occasions. John Bayliss was born in Tredworth in 1943 and was educated at Hatherley Secondary Modern School. He first played for Fielding and Platt RFC at the age of 13 and for England Boys Club against Wales at full back at the age of 14. He joined Gloucester and made his debut for Gloucester United before his 17th birthday. He quickly built a reputation as one of the hardest tacklers in the game and after a handful of matches for the 1st XV was selected to play for Gloucestershire against Monmouthshire in October 1961. He kept his place that season and was to remain a regular county selection throughout his career. John’s tackling was legendary and he likes to tell the story of a game against Somerset when he tackled Turner the Somerset wing on the 25 yard line, the ball flew over the goal line and John Haines, following up, scored the try. John Bayliss’s style of play was ideally suited to Rugby League and in the 1968-69 season he was offered terms by the Warrington club after trying out for them at St Helens but he decided to stay in the amateur game and play on for Gloucester. He was now getting noticed in the press and was close to representative honours. He was chosen to play for Western Counties against the Springboks at Bristol in December 1969 dropping out late through injury, and played against the Fijians at Kingsholm in October 1970. 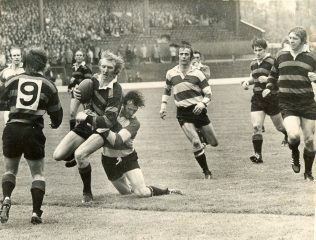 In 1972 John was a member of the great Gloucester team which won the first knockout cup without playing a game at Kingsholm, knocking out Bath, Bristol, London Welsh and Coventry on the way to the final with Moseley. He was a reserve for the England tour of South Africa that summer. The following season John Bayliss was made Gloucester captain. He played for Western Counties v the All Blacks at Kingsholm and for the South and South West against the North in the first England trial. Things were going well for Bayliss and Gloucester when he suffered a broken neck – an injury that was expected to end his career. He made a comeback in autumn 1974 and by December was playing for South and South West in the first England trial at Roehampton. He regained his county place and went on to play for the victorious Gloucestershire side in the 1974 County Championship Final against Lancashire. He captained Gloucestershire to CountyChampionship success in 1975 against Eastern Counties and 1976 against Middlesex and after captaining the county on a tour of South Africa in summer 1976 he retired from senior rugby. But John was still not done. He was persuaded to join Gordon League, who were in the middle of a two year unbeaten run, and played in their last minute 9-4 defeat by Bill Beaumont’s Fylde in the last 16 of the 1977 John Player Cup. The Times said “The competition will produce few better games with more atmosphere.” He returned in 1978 for Gloucester’s summer tour of the USA. He is still involved with the Gordon League club and in fund-raising for charity.